St James’s Church has achieved a lot in its 150 plus years and the future is exciting, but that future is in our hands. Maintaining the building, expanding our ministry and supporting charities all cost money. The Church of England encourages us to give 5% of our net income to the church and a similar amount to other work that helps to build God’s kingdom. This is consistent with the biblical principle of the tithe. Only with a regular, budgeted income can future activities be undertaken. 'Planned giving' means supporting the church with a regular payment each month, quarter or year. If you gift aid your payment, every £1 you give is worth £1.25 because St James’s Church can reclaim from the government the tax paid on the money you give. This is at no cost to you. If you are a higher rate taxpayer you can claim a personal tax benefit, which means every £1 you give will cost you only 75p. To enable us to reclaim the tax and increase the value of our gift you should complete the Gift Aid Declaration. The best way you can give to St James’s Church is by standing order or via the new Parish giving scheme. This allows the church to plan with greater certainty of income. If you are a tax-payer we can reclaim gift aid on your donations so please complete a gift aid declaration. Parish Giving is a Direct Debit scheme administered by the diocese who claim gift aid on our behalf. Giving can optionally be index linked. All donations are transferred back to the parish each month plus any gift aid that is claimable. Information packs are available from the parish office. If you would prefer to give by standing order you can download a form here. It is simple to complete and we will set it up for you. 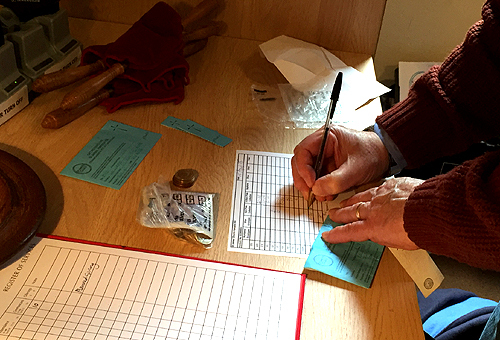 Alternatively the form includes our bank details and you can set up your own standing order via online banking. Regular giving can be for a large or small amount. Some people pay a sum by standing order and make extra donations in church when their finances allow. Any amount, small or large, is welcome and can be changed according to circumstances. An alternative way of giving is by using the weekly white envelopes or the blue gift aid envelopes. Some people choose to put cash in the collection plate. We hope that you will review your giving (can you increase it? ), join the Planned Giving scheme, if you don’t already use it, and help us recover the tax paid by signing the Gift Aid form. Thank you.